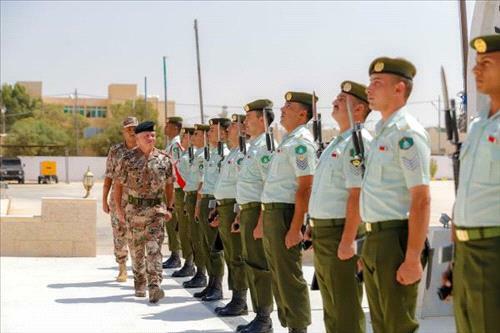 AMMONNEWS - His Majesty King Abdullah II, the Supreme Commander of the Jordan Armed Forces-Arab Army (JAF), on Monday visited the Non-Commissioned Officers (NCO) Training Academy in Zarqa. Upon arrival at the facility, the Supreme Commander was welcomed by Chairman of the Joint Chiefs-of-Staff Lt. Gen. Mahmoud Freihat, and the Academy's Commander, Warrant Officer/First Class Mohammad Smadai. His Majesty toured the Academy, checked on the various training courses it holds, and listened to a briefing on the technical programs run by the military institution. The Supreme Commander voiced his pride in the NCO's hard work and the advanced level it had reached in terms of training efficiency, readiness, high spirits of recruits and prowess in performing their duties. He said that NCOs are the backbone of any army across the world and are deemed as the cornerstone of operational, training, logistical and technical duties. His Majesty wrote in the Academy's guestbook that he immensely trusts and supports NCOs, who are an example for discipline and loyalty.